Jotun's Jorn Tandberg and Inge Brigt Aarbakke produced arguably one of the great drives in one of the most spectacular races seen in Class 1, scything their way past both Victory boats and back-markers to win today's BMW Norwegian Grand Prix in Arendal, sending the tens-of-thousands of home supporters into a complete frenzy. Last year's winner, Jean-Marc Sanchez, and Abdullah Al Mehairbi in Victory 7 finished second ahead of team-mates and Championship leaders, Victory 1's Mohammed Al Marri and Nadir Bin Hendi. Starting from second on the front row, Jotun's all-Norwegian pairing, running in only their second race together, found themselves a place down by the end of the opening lap with both Victory boats ahead of them, with Qatar 96, the pole sitters trailing in fourth. By the end of lap six, with both Jotun and Victory 1 having taken one long-lap, they came into the start-finish turn side-by-side. Jotun had the inside-line, held their nerve, went tight in the turn and moved into second place. Five laps later, with the leading trio having completed both mandatory long-laps, it was Victory 7's turn to feel the heat as Jotun bore down on them - again as they approached the start-finish turn - and despite a pair of back-markers in front of them, Jotun scythed their way through the traffic - at one point coming together with Victory 7 - before passing them on the outside of the turn to take the lead, going on to win the 17-lap, 96.21Nm BMW Norwegian Grand Prix by 13 seconds. "That was a new experience for me - it was fantastic. I have never been in a complete race before and I have never experienced anything like this," said Inge Brigt Aarbakke. "To come from fourth place after the start and to take both Victory boats is something very special." Despite a spectacular start, moving from fourth on the front row to lead at the first turn and for 11 of the 17 laps, Victory 7's Jean-Marc Sanchez and Abdullah Al Mehairbi had to settle for second place. "That was definitely the toughest race of the season," said Al Mehairbi, "When we got caught up with the back markers, we saw Jotun coming up quickly by our side and decided to close the door. But they held their nerve, we traded some paint and they were gone." Second spot for Victory 7 keeps Jean-Marc Sanchez's European title defence alive, reducing the gap to team-mates Victory 1 to 13-points with one race to go. And although their winning streak is now over, third place for Mohammed Al Marri and Nadir Bin Hendi means they still have a commanding 21-point lead in the overall title race. For Sheikh Hassan and Steve Curtis, despite the advantage of starting from pole position, the race was lost at the start, and the points' gap that they had hoped to reduce between themselves and the leaders has now increased. "We were cut off at the start by Victory 1 and there was no way back from being in the wake of three boats. We pushed hard but gained very little." said Curtis. Qatar 95 maintained their pole status throughout, with Abdullah Al-Sulaiti and Matteo Nicolini finishing fifth ahead of a solid performance by Tom-Barry-Cotter and Pal Virik Nilsen in Maritimo, who were given a wild card entry by the event organisers, and proved to be the strongest of the middle order. 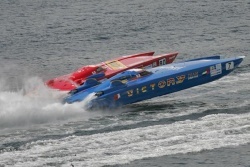 After a frustrating weekend beset by technical problems, Foresti & Suardi went the race distance picking up points in seventh place ahead of Roscioli Hotels Roma crew of Domenico Cirilli and Sergio Carrasco, who despite limited time on the water this weekend due to repairs being made to their boat, also picked up points with Carrasco gaining more valuable race experience. But there was disappointment for Qatar 9 and SeveneleveN, both retiring with technical problems.